Cooking without regrets. It's the goal of every home cook. Some of us can get scared to get into the kitchen because there's so much room for error: adding too much salt, cooking bland, gray meat, etc. After putting (sometimes) hours into making a delicious meal - a wonderful main dish, a bunch of fantastic sides, and maybe even a scrumptious homemade dessert - it's just about the worst the thing to realize that what you're cooking isn't coming out correct. There's a moment of panic here. What do I do?! Takeout?! Frozen Lasagna?! When is a meal 'too ruined' that it's gone past being something worth saving? Apart from the oven being on fire, it's actually a fine line and there are many tips and tricks you can use to help save a ruined meal. What are some of your favorite cooking hacks for cooking without regrets? 1. Meat isn't browning? Don't turn up the heat and try to scorch everything in the pan! Instead, make the pan less crowded. If you're cooking fatty meat there might be too much liquid in the pan. Either drain it or cook for a little bit longer than recommended so that the liquid starts to evaporate and you can actually start to get a good brown going on. 2. Roast is over or under cooked? This is actually an easy fix - but you have to be a little adventurous. If the outside is already crispy but the inside is still raw you don't want to cook it much longer as you might end up burning the roast. Instead, shred or chop up the roast, add some liquid (either a quick gravy, water, crushed tomatoes with some spices or even some store bought bbq sauce), and put it back in the oven until it's fully cooked. Ya, it's not the fancy roast you were trying to make but we bet it will still be delicious. 3. Fried food coming out soggy? This is one of the few times in cooking when you should turn the heat up. You know your stove better than we do so we're not going to recommend an exact 'setting' but make sure that the oil is hot enough that if you drop some flour into the pot it immediately starts to brown. Overcrowding the pan will lower the temperature so make sure to cook in batches and adjust the heat as you add and take out food. Also, have a plate with thick paper towels on top set up to hold the food as it comes out - the less oil that remains on the food the crispier it will turn out. 4. Hollandaise or homemade Mayonnaise breaking? This is super frustrating because making a special sauce like this is not something we do every day. 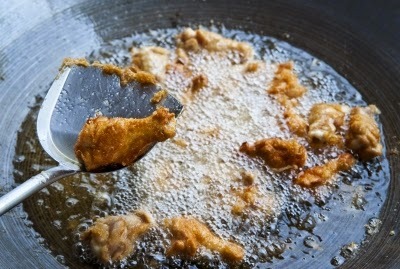 Breaking occurs when the fats and liquids in a sauce separate. Instead of a smooth sauce you end up with a clumpy, grainy mess that doesn't look too appetizing. To fix a broken hollandaise or homemade mayo, the best thing to do is to whisk together another egg in a separate bowl with a little liquid (water or lemon... don't use oil) and add it back into the main sauce just before serving, stirring quickly. If this doesn't work (or if you do this, it works, and then you wait too long and it breaks again) try adding a few drops of cool water while stirring vigorously. 5. Food too salty? Without constantly tasting food it's difficult to judge how salty it's going to turn out. The worst part about making salty food is that there's no way to just take the salt out. The best cooking hack is to add some starch like potatoes or noodles. As these cook they will start to absorb the salt (although they'll also start to absorb some of the other flavor too). If you have remaining ingredients from the original recipe on hand, try increasing the serving size of the recipe without adding any more salt. How do you save a ruined dish?